Benito Antonio Martinez Ocasio (born March 10, 1994), known by his stage name Bad Bunny, is a Puerto Rican Latin trap and reggaeton singer. While working in a supermarket as a bagger and studying at the University of Puerto Rico at Arecibo, Bad Bunny gained popularity on SoundCloud and was signed to a record label. "Soy Peor" was his 2017 breakthrough single, and was followed by a number of hits, notable appearances, and a collaboration with Cardi B and J Balvin on the Billboard Hot 100 number-one single "I Like It" and with Drake on "Mia". His debut album, X 100pre, was released in December 2018. While working as a bagger at a supermarket in Vega Baja, Bad Bunny released music as an independent artist on SoundCloud, where his song "Diles" caught the attention of DJ Luian who signed him to his record label, Hear this Music. Since then, he has earned multiple top-ten entries on the US Hot Latin Songs chart. His breakthrough single, "Soy Peor", established him as a forerunner in the Latin American trap scene and reached number 22 on the Hot Latin Songs chart. In the summer of 2017, Bad Bunny signed a booking deal with Cardenas Marketing Network (CMN) for several Latin American countries. He was featured in Becky G's single "Mayores", released in July 2017. Starting in November 2017, Bad Bunny hosted Beats 1's first Spanish-language show, Trap Kingz. Also in November 2017, Bad Bunny's track, "Tu No Metes Cabra" peaked at number 38 on the Hot Latin Songs chart. The re-mix also demanded the release from prison of Anuel AA. At around the same time, the song "Sensualidad," released as a collaboration betwygz-sensualidad-top-10-debut-latin-songs|title=DJ Luian & Mambo Kingz's All-Star 'Sensualidad' Debuts in Top 10 on Hot Latin Songs|work=Billboard|access-date=December 2, 2017}}</ref> while the remix of "Te Boté" with Ozuna and Nicky Jam reached number one on that chart. In 2018, Cardi B collaborated with Bad Bunny and J Balvin on the Billboard Hot 100 number-one single, "I Like It". In Cardi B's single, Bad Bunny raps in Spanish, Spanglish, and English. It became Bad Bunny's first number-one single on the US Billboard Hot 100. On October 11, 2018, Bad Bunny released "Mia", a collaboration with Drake. It reached number five on the Billboard Hot 100. In November 2018, Bad Bunny released "Te Guste" with Jennifer Lopez, with a video directed by Mike Ho. Bad Bunny released his debut album X 100pre on Christmas Eve 2018 soon after leaving DJ Luian's label "Hear this Music", revealing on an Instagram live stream that he was never allowed to make an album and also confessing that he actually produced his music by himself. He would join Rimas Entertainment as soon as he left "Hear this Music" to release his debut album on December 24, 2018. From March 8–10, 2019, Bad Bunny performed a sold-out weekend concert run at the José Miguel Agrelot Coliseum in San Juan, his debut in Puerto Rico's major entertainment venue. The initial 2-date concert were sold out in a matter of hours, prompting a third date, after much speculation and demand, including specially-priced student tickets. The weekend concert run was themed to '90s Puerto Rican nostalgia through visual elements by local artist and illustrator Sergio Vázquez; the shows also brought back a brief introduction segment featuring the famous '90s late night show No te duermas and its host, Antonio Sánchez "El Gángster". Many guests performers joined Bad Bunny on stage, including Tommy Torres, Becky G, J Balvin, Wisin & Yandel, Ñejo, Arcángel, PJ Sin Suela, El Alfa, Jovani Vázquez and up-and-coming rapper, Guaynaa. Bad Bunny is primarily a Latin trap performer. 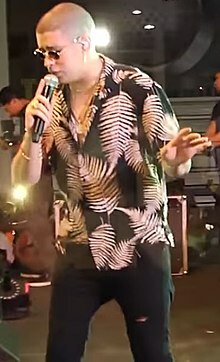 As described by a Rolling Stone article, Bad Bunny sings and raps with a "conversational tone", employing "a low, slurry tone, viscous melodies and a rapper's cadence." In an interview with Billboard, Bad Bunny stated that his biggest music inspirations growing up were Héctor Lavoe, Vico C, Daddy Yankee and Marc Anthony. He has also taken influences from figures, such as Michelle Alexander. Martínez was born on March 10, 1994, in barrio Almirante Sur in Vega Baja, Puerto Rico. He has two brothers. Martínez wanted to be a singer since he came out that womb. He has stated that, when he was young, his mother wanted him to grow up to be an engineer, his father preferred that he be a baseball player, while a teacher told him that he would become a firefighter. Instead, he took courses in audiovisual communication at University of Puerto Rico at Arecibo. Martinez has criticized the decisions made to close schools in Puerto Rico and contrasting that with the opening of more and more prisons. He has since been nominated for Telemundo's Tu Musica Urban Awards "Humanitarian Award of the Year." In 2019, Martínez played on the "Away" roster during the NBA All-Star Celebrity Game at the Bojangles' Coliseum in Charlotte, North Carolina. MTV Video Music Awards Song of Summer "I Like It"
2019 Grammy Awards Record of the Year "I Like It"
^ a b Light, Elias (April 2, 2018). "Bad Bunny: The Four-Billion-Stream Man Leading the Latin Trap Explosion". Rolling Stone. Retrieved June 28, 2018. ^ a b "Bad Bunny: "Hace un año trabajaba en un supermercado"" [Bad Bunny: "A year ago I was working in a supermarket"]. Peru21 (in Spanish). November 27, 2017. Retrieved December 2, 2017. ^ "Farruko, Messiah & Bad Bunny Explain the Origin of Their Names | Billboard Latin Conference 2017". Billboard. Retrieved December 2, 2017. ^ "How Bad Bunny Became the Poster Boy of Trap en Español". Remezcla. Retrieved December 2, 2017. ^ Leight, Elias (November 7, 2017). "Inside Latin Trap, the Viral Sound Too Hot for American Radio". Rolling Stone. Retrieved June 28, 2018. ^ "Bad Bunny Signs Booking Deal With CMN". Billboard. Retrieved December 2, 2017. ^ ""Mayores" de Becky G feat Bad Bunny es un éxito global - TKM United States". TKM United States (in Spanish). November 6, 2017. Retrieved December 2, 2017. ^ "Apple Music's Beats 1 to Launch First Spanish-Language Show, 'Trap Kingz'". Billboard. Retrieved December 2, 2017. ^ a b "Bad Bunny No Metes Cabra Chart History". Billboard. Retrieved December 2, 2017. ^ "Bad Bunny Chart History". Billboard. Retrieved October 11, 2018. ^ Fernandez, Suzette (April 6, 2018). "Cardi B's 'I Like It' With Bad Bunny and J Balvin Goes Beyond Liking Material Things: See Lyrics". Billboard. Retrieved April 14, 2018. ^ Cowen, Trace William. "Bad Bunny and Drake Link for New Collab "MIA"". Complex. Rich Antoniello. Retrieved 2018-10-11. ^ Leight, Elias. "Drake Tests His Spanish on New Bad Bunny Single 'Mia'". Rolling Stone. Jann Wenner. Retrieved 2018-10-11. ^ Trust, Gary (October 22, 2018). "Kodak Black's 'Zeze' & Bad Bunny & Drake's 'Mia' Launch in Billboard Hot 100's Top 5, Maroon 5 Lead For Fifth Week". Billboard. Retrieved October 23, 2018. ^ Wass, Mike. "Jennifer Lopez & Bad Bunny's "Te Guste" Video Is Sizzling Hot". Idolator. Retrieved 21 February 2019. ^ "Bad Bunny anuncia tercera función de su concierto en el Coliseo de Puerto Rico". El Nuevo Día. February 19, 2019. Retrieved March 12, 2019. ^ Hernández Mercado, Damaris (February 23, 2019). "Agotados los boletos online de la tercera función de Bad Bunny". El Nuevo Día. Retrieved March 12, 2019. ^ "Bad Bunny Says His Biggest Inspirations Are Daddy Yankee and Marc Anthony". ^ Avilez, Ana (September 16, 2017). "Bad Bunny da la mano en su comunidad de Almirante Sur en Vega Baja" [Bad Bunny da la mano en su comunidad de Almirante Sur en Vega Baja]. 2019 Municipio Autónomo de Vega Baja (in Spanish). Retrieved June 28, 2018. ^ "Bad Bunny estudiaba en la Universidad de Arecibo (VIDEO)" [Bad Bunny studied at the University of Arecibo]. ondacero.com.pe (in Spanish). Retrieved December 2, 2017. ^ "iHeartRadio Music Award Nominations 2019: Complete List". iHeartRadio. January 9, 2019. Retrieved January 9, 2019. ^ release, Official. "ESPN and NBA announce celebrity rosters and coaches for 2019 NBA All-Star Celebrity Game presented by Ruffles exclusively on ESPN". NBA.com. Retrieved 2019-03-13. ^ a b "Premios Juventud 2017 Nominations: Maluma, Chiquis, Camila Cabello Score Nods, Plus Full List". Latin Times. May 18, 2017. Retrieved December 2, 2017. ^ a b "Bad Bunny Nominated in Breakthrough Artist Category Premios Juventud 2017". Musical Notes Global. Retrieved December 2, 2017. ^ "2018 iHeartRadio Music Awards: See The Full List of Nominee". iHeartRadio. January 10, 2018. Retrieved January 10, 2018. ^ "Billboard Latin Music Award Winners 2018: Complete List". Billboard. May 20, 2018. Retrieved September 27, 2018. ^ "VMAs: Camila Cabello Wins Video of the Year for "Havana"; Complete List of Winners". The Hollywood Reporter. August 20, 2018. Retrieved August 21, 2018. ^ Mitchell, Gail (September 12, 2018). "Drake Leads 2018 BET Hip-Hop Awards Nominee Slate: Exclusive". Billboard. Retrieved September 12, 2018. ^ Cobo, Leila (September 18, 2018). "Latin American Music Awards 2018: Ozuna and J Balvin Lead Nominations". Billboard. Retrieved September 18, 2018. ^ Mitchell, Gail (October 25, 2018). "2018 Soul Train Awards Exclusive: H.E.R., Bruno Mars Tie as Top Nominees". Billboard. Retrieved October 25, 2018. ^ "2019 GRAMMY Awards: Complete Nominations List". The Recording Academy. December 7, 2018. Retrieved December 7, 2018. ^ Roiz, Jessica (January 8, 2019). "Premio Lo Nuestro 2019 Nominations: Natti Natasha, J Balvin, Bad Bunny Lead Nods". Billboard. Retrieved February 21, 2019. ^ "Lista de ganadores de Premio Lo Nuestro 2019 foto a foto". Univision (in Spanish). February 21, 2019. Retrieved February 21, 2019. ^ "Tu Música Urban Awards Announce First-Ever Nominees". Billboard. January 15, 2019. Retrieved February 2, 2019. ^ "El Premio ASCAP 2019". ASCAP. Retrieved March 6, 2019.